This past week, my family and I traveled to Baltimore, MD, for the 2009 Care Net Conference. In their own words, Care Net and their network of more than 1,100 pregnancy centers offer hope to women facing unplanned pregnancies by providing practical help and emotional support. I attended the conference as an exhibitor to talk to various people about my story and pro-life speaking opportunities. The conference was wonderful and not only did I get to meet so many people, but those new people made me feel as if I were already part of the Care Net family. While the conference was great, my favorite part of the trip was the couple of days after the conference when my daughter, Hannah, and wife, Joni, and I got to play in Baltimore. At one point during those two days, my wife told Hannah to “hold daddy’s hand while we walk” because Joni’s hands were full and we were in a crowded area. Now, before you think my wife was being insensitive, in our family, we exchange the words “foot” and “hand” all of the time when referring to me as my feet serve as my hands. We’ve never gotten hung up on word choices. What amazed me, though, is that our 18-month daughter had already picked up on this, and when instructed, she walked right over to me and grabbed my foot. We came together in that pose many times throughout the trip, and I’m sure we will many times to come. What is so inspiring and amazing to me is Hannah’s acceptance of what is “normal” in our family. She doesn’t know any differently, so she treats me with full acceptance and love unlike the world around me that often treats me as handicapped before they get to know me. Hannah’s attitude shows what we all could be like if we simply treated others with respect and love without judging others based on looks. 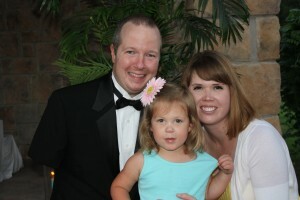 I love my girl just as much as any other father loves his child, and my daughter loves me with no regard to how I look. That is amazing. In the form of a quick update: Joni is doing just fine and recovering well. Hannah had her first doctor’s appointment recently and she is doing great. Thanks so much for your thoughts and prayers. I want to talk just for a moment about how I believe the world perceives people who are different. 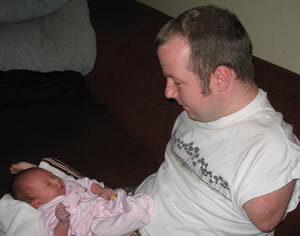 Still, though, many people who did not know us very well insisted that some adjustments be made so that I could cuddle with Hannah once she was born. The folks giving this advice were well meaning, but I must say that their advice bothered me. You see, for my whole life, people have tried to “fix” me. From a very early age, doctors wanted to do all sorts of procedures and tests to make me “as normal as possible.” While some did get a chance, they all failed. Now, I will say that the therapists that worked with me at a young age did wonders for me. But, the difference is that the therapists got me to use what I have to function in life, instead of trying to change me to look like everyone else. 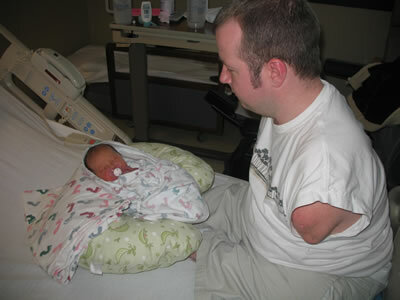 I have learned in 28 years without arms that I AM as normal as possible…as long as I want to be. I need no doctors’ procedures, no kind advice, and no prosthesis to make me look like everyone else. In other words, “I’m Not Broken.” I don’t mean this in a spiteful or resentful fashion, but rather, I want to inform the world that making me look like you may make you feel more comfortable, however, I couldn’t be more comfortable with who I am. I don’t need to be changed to fit in. My attitude in life is to go full-steam ahead and never desire to be who I’m not. I will never have arms. I will never look like everyone else. I will never hold Hannah like everyone else. But, for me, this is not a sad thing. I just have to learn “what works for me” in each and every situation. So, the picture on the right is of me “holding and cuddling” with Hannah. No, she’s not against my chest, but then again, how else would I feel her without being able to touch her with my feet? My feet are my hands. So, the advice I was given was to make sure and buy a sling to put her in so that she could be up against my chest. We bought one…and maybe we’ll use it. But, inevitably, I’ll want her out of the sling and on my lap or on the floor so that I can bond with, play with, and touch my daughter. It may not look like how you would bond with your child…it may not look like how my own wife bonds with Hannah…but it is what works for me! Hannah, Joni and I will figure it out for each and every situation that comes our way…and we will great each challenge with a smile because that’s how we believe life should be lived. Hannah is here. 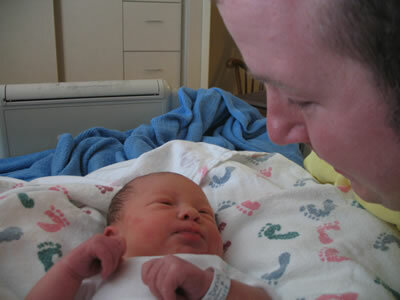 She was born on Thursday, March 6th at 11:35AM – weighing in at 8 lbs 5 oz – measuring 20 and a half inches. I am overwhelmed with emotions and excitement…and a complete lack of sleep! We are all home, now, and I’ll put more thoughts into words when I can. I leave you with a couple of pictures as we start our journey! My wife and I just found out that our first baby will be arriving this Thursday. We are so excited, and it seems that 9 months has flown by. (Well…maybe not “flown by” for Joni…but for me it has!) 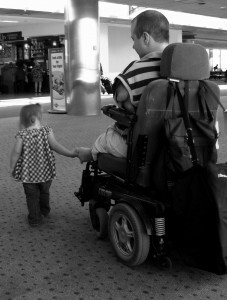 I plan to blog some about my adventures as a handicapped parent. I believe I can give my new daughter a great life and that while their may be physical obstacles to overcome, nothing will prevent me from loving and caring for “Hannah.” Life will soon be different…and I can’t wait. One item I did want to mention is that Joni found a crib for Hannah that has a door at the short end which I can open by pressing two buttons. The crib is advertised as a way to quickly and easily change the sheets, but for us it is a way that I can get Hannah out of her crib in case of an emergency…or whenever I need to do so. The peace of mind that I have knowing that I can get her if needed is a welcome relief to a big concern I had. You can find more about the crib here. 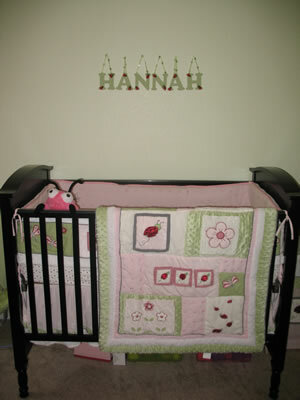 The picture to the left is of Hannah’s nursery. When I post again, I’ll be a father. Wow.